Just as you change up your wardrobe during the different seasons, you should do the same with your makeup to give your look a fresh springtime lift. Take a peek inside your makeup bag to see what you want to replace or swap out and then stock up on fun, new products. Here are a few suggestions for switching up your makeup this spring. In the fall and winter, we tend to gravitate toward a richer, full coverage foundation. That said, it’s fine to keep this in the rotation if it’s a nice, hydrating formula with soothing organic aloe juice that also offers a satin, slightly dewy finish. You do you. If you want to go for lighter coverage, you could try a super-lightweight face powder instead that can be used alone or over a tinted moisturizer. Look for a natural formula with oil-absorbing rice powder, soothing calendula, chamomile, and skin-purifying eucalyptus. Another option is a BB cream that offers full to medium coverage but still looks natural. What’s awesome about a moisturizing BB cream is that it acts as a primer, concealer, and foundation all in one formula. Try a few different options mentioned above to see what is going to work best for your lifestyle this spring. If you’ve been sticking to black or brown mascara and eyeliner in the past, now is the time to play with some different colors. With your lengthening mascara, try making a subtle shift in color—even if it’s from black to a deep neutral purple or from brown to a deep denim blue. For eyeliner, try a pop of color with a royal blue. With a simple swipe along your lower and upper lash lines, you can define your eyes and make them pop. Look for a long-lasting, creamy formula in a pencil to define your eyes beautifully. If you haven’t tried a product that acts as a lip and cheek tint in one, spring is a great time to give it a go. 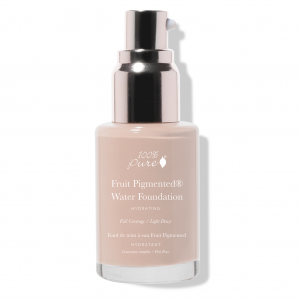 The Fruit Pigmented® Lip & Cheek Tint from 100% PURE is a great example. It comes in several pretty shades and is designed for double duty as a cream blush and lip tint. The formula contains vibrant fruit pigments, plus shea and cocoa butters to soften skin and lips.You can apply the tint directly to your cheeks and blend with your fingers for more intense color. Or, you can gently use your fingers to gradually apply the product to your cheeks and then blend for a more natural look. And last, as you find yourself spending more time outdoors in the next few months, don’t forget to protect your skin with sunscreen. The sun feels great, but its harsh rays can damage your skin if you aren’t applying SPF properly and regularly. 100% PURE isn’t just a brand name—it’s a commitment to make the purest and healthiest products while educating everyone on why being 100% PURE is essential. Their natural ingredients originate from nature and only undergo chemical changes due to biological processes such as cold processing, fermentation, and distillation. 100% PURE’s cosmetics are colored from vibrant fruits, vegetables, teas, and other pigments,and contain plentiful amounts of beneficial vitamins, antioxidants, and other healthy phytonutrients that make skin healthier. The company offers many products for hair, skin, and body, including a retinol eye cream, lengthening mascara, pigmented eyeshadow, and more. 100% PURE’s ingredients are sourced from nature whenever possible to help their customers look and feel their best.